The Toyota Hiace is one of the world's most popular commercial vehicles. Outside of the US and Canada, that is. Barred from import by a combination of the Chicken Tax and crash regulations that tend to be less than friendly towards forward-control setups, the Hiace is a pretty rare sight in the States. When I saw this Mexico-plated one in Cambridge, MA, I had to get a few shots of it. It's a high-roof 15-passenger model that is often used in developing parts of the world as a taxi. You might have seen one in a recent episode of Top Gear representing the quintessential South African cab. I personally rode on one of these vans in Ethiopia once for a six-hour drive on rutted roads and was less than impressed. What the the high roof provides in visibility and airiness, the low seating takes back in legroom. The engine sits between and below the front seats. A quick search of Toyota's Mexico website tells me that the engine riding under the floor is a 2.7 liter I4 connected to a 5 speed Manual. A nice basic powertrain for a simple people mover. 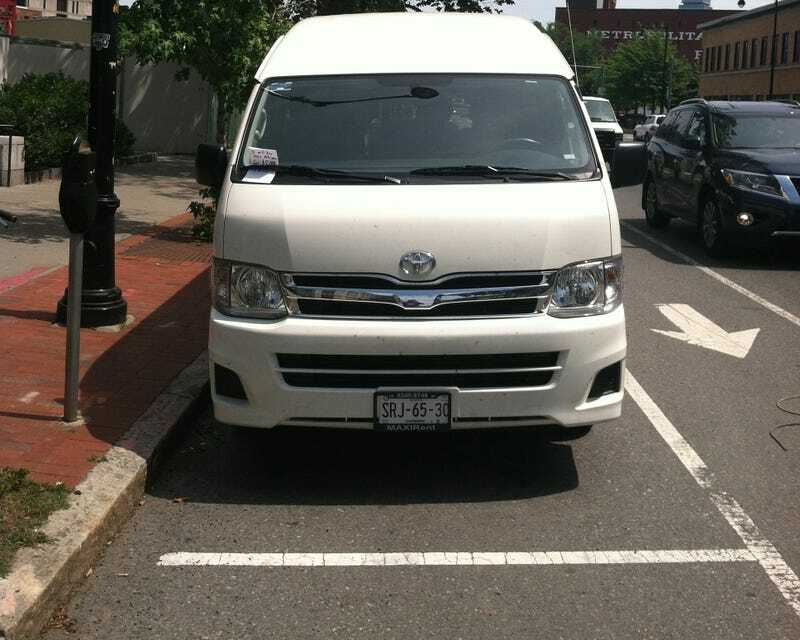 This Hiace is a rental from Mexico, perhaps bringing the best and brightest to Cambridge for a college tour. For a trip like the one from Mexico to New England, I'm not sure I'd want to be riding in the back of one of these, but for short distances like those you'd cover in a share-taxi, the tough Hiace might be the perfect vehicle. It's always a treat to see cars from other markets in the relatively homogeneous States, although I've seen more and more Mexican vehicles in the past few months. It turns out that someone else saw this van and was as interested in it as I am. They left a note under the wiper with a taste of just how much they're willing to invest in a unique Japanese car. Note-writer, If you're a fellow Jalop make yourself known. All photos are mine. Follow me at @2Fast2Finkel on Twitter and Instagram for more DOTS sightings and other #carmagnum posts.